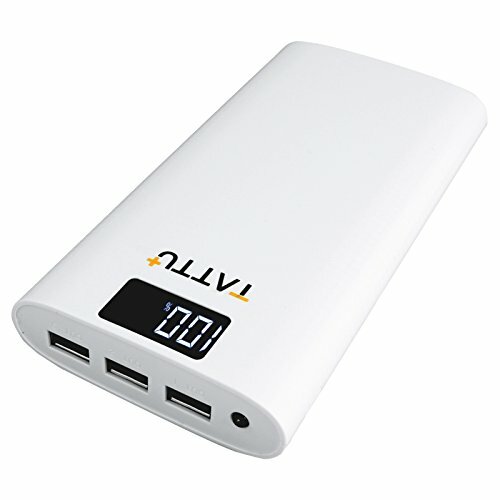 About us:Tattu LED display power bank has 10400mAh huge capacity indeed, equal to 15000mah power bank in the market. More powerful than 10000mah charger while in the same price. Tattu portable charger is compatible with iPhone, iPad, Samsung Galaxy, Android and other Smart Devices, great design for travel and others outdoor use. PowerCore 10400 revolutionizes high-capacity portable charging. It fits easily into any pocket or bag, making it the perfect charger for on the couch, on a plane or anywhere else your phone needs a boost. Premium Lithium Polymer cell endures up to 800 charge cycles for extended service life. Integrated with voltage surge and over-discharge protections, the battery pack will automatically shut down if a charging error occurs. This power bank come with 3 USB output ports to charge devices simultaneously, you can charge three devices at the same time. Please feel free to contact us in any issues. Accurate Capacity: Build in a LED display, shows you the accurate available power remains, helps you to notice when it needs to be charged. More powerful than other 10000 mAh power core with high quality battery cells. Convenient for Travel: 3 USB output ports for you to share the power with your friends and families. ONLY one charger needs for three persons. Certified Safe : Up to 5 protection systems offer safety using environment, protect your portable bank from short-circuit, over voltage, over current, over charge& over discharge. If you have any questions about this product by TATTU, contact us by completing and submitting the form below. If you are looking for a specif part number, please include it with your message.